Nothing significant. Our big trading partner is growing at leaps and bounds. Trump and China's leader have held meetings and talks. China's middle class is growing. China has an air pollution problem. Their new "national bird" is the construction crane, ha ha. China is North Korea's main sponsor, big deal, they're bad but China is our friend. Even though China supplies almost everything to North Korea and could stop them cold if they wanted to. Hey, isn't stuff going on with North Korea now after Trump's meeting? "The Chinese Communist Party has for decades waged a quiet war against the United States, mobilizing all elements of its society and targeting the institutions and foundations of the American system. The strategies pull from the Soviet-era practices and are part of the Chinese regime's system of 'unrestricted warfare,' which promotes the idea of war without morals. 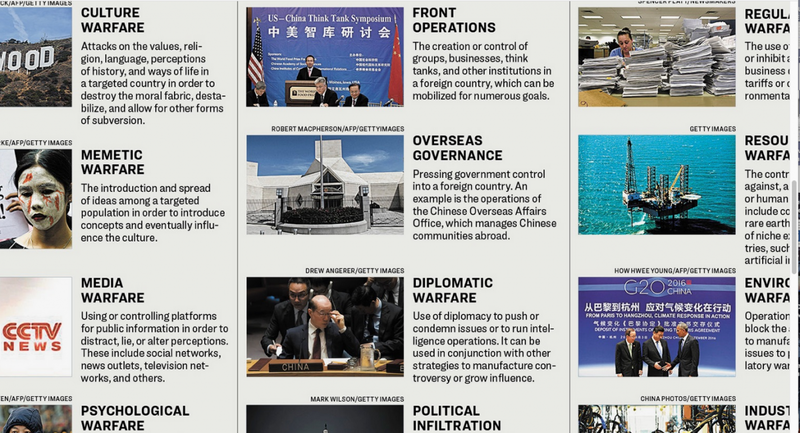 "The Epoch Times* lays out the various strategies used in this hidden war in a new infographic and reveals the use of each strategy. Among the more than 40 strategies explained are culture warfare to break the moral fabric of a society, cyberwarfare as a tool to achieve various goals, economic warfare to rob and destroy a country's economy, and psychological warfare to alter he way people interpret information." *The Epoch Times is an English language newspaper, published in California, by journalists with a different and inner view of China, covering subjects that American media won't go near. See the full infographic and be horrified: https://www.theepochtimes.com/infographic-chinas-secret-war-against-america_2458236.html. Accuracy of reporting on our friends the communist Chinese is almost as accurate as mass media reporting on anything concerning firearms. Trump met with Chinese leader Xi Jinping at Mar-a-Lago, Trump’s opulent Florida estate. China this, China that, China refuses to control North Korea, which is totally dependent on China for almost everything. Everyone who fails to refer to communist China as communist China is supporting and helping to hide the true nature of this brutal inhumane communist dictatorship. The communists’ long-range goal is the utter annihilation of America, capitalism, human rights and everything you believe in. They are in a fortunate bind (for us), because they depend on us for buying all their stuff. In the March “free” elections in Hong Kong -- the formerly super-robust free market which the commies took over -- the red commie rulers carefully selected a mere 1,200 people to vote (island population 7.2 million). Right, it doesn’t sound fair. And two who refused to take an oath to communism were later disqualified. Current whereabouts unknown. Prison terms for dissent, religion, reporters, internet users, anyone the regime deems worthy of prison are easy to obtain, since due process or even justice is not in their play book. It’s a dictatorship, remember? Expansion of their military bases on land they do not own continues, with no one willing or really able to stop them way out there in the South Pacific. These clever communists are using dredges to create land that didn’t previously exist, and claiming that for their own. Perhaps one of the best things in all this is the rivalry between commies in Russia and commies in China, who basically hate each other and wish the other dead, so the last man standing can rule the world, if they can get us out of the way. It’s in our interest to sidle up to both, keep the other guessing, and remember they are both dedicated anti-American commie villains, like in the old red-scare days, a point phony news reports insist on hiding. America is safer awake. BTW, in Chinese the new ruler’s name is pronounced “chee” so whose idea was it to spell it “Xi”? It’s just more phony news from officials, backed up by the entire press corps -- without a single dissenter. Make it hard to say or know who the ruler is. Xi, like Xerox? Or maybe, xenophobia: “intense or irrational dislike or fear of people from other countries.” President Chee. Safe as "Blocks of concrete"? C'mon! The Tribune states that the B61s are broadly considered more a political symbol of US commitment to the NATO alliance than a military asset. The US does not have aircraft at Incirlik airfield qualified to deliver the weapons. For the weapons to be used, the US would have to fly a squadron of aircraft into Incirlik to load the bombs, all of which would be observed by Russia and possibly make the base a target of a first strike. If the airbase in southern Turkey base is overrun by neighboring Syria, or the Islamic radicals in Syria, both just a short drive away, or the poorly identified coup rebels already in Turkey, the scores of nuclear bombs there are anything but secure, this much is obvious to a retard, a word that politically correct forces threaten us for using. Clark is not retarded but perhaps thinks we are. Calling captured nuclear bombs with trigger locks "blocks of concrete" wouldn't fool Oliver Wendell Holmes, who recognized a three-tier hierarchy of idiots -- morons, imbeciles and idiots, from stupid to stupidest. He decided it was fine to sterilize a woman because she was in category two, an imbecile (and she wasn't actually but the federal government sterilized her anyway, thanks to Oliver). But I digress. A nuclear weapon even without a trigger, let alone one with a perfect trigger lock (and there is no such thing, since someone can operate it, right?) is packed solid with enough unstable nuclear metal to explode -- uranium or plutonium -- just what jihadis or terrorists want. And it's also got enough hi-tech hi-explosives to set it off, that's how these things work. A block of concrete indeed! What sort of blockheads do they think we are? Even unbathed jihadis in rags can figure this much out. Journalists, reportedly intelligent, didn't question the general. As to acting easily and getting them out quick, and I won't reference Benghazi here, the political implications of "declaring" the situation so dire, and our most heavily armed NATO ally unfit to store the things by rashly pulling them out, this is drastic or we'd have done it long ago, aside from demonstrating how weak we now are. And finally, the abject nonsense that we have no system qualified for delivering a B61 tactical nuke, a design from the early 1960s and among our oldest, whose yield apparently ranges from 300 tons to 170 kilotons of TNT, c'mon! If the Iranians had one, just for starters, they could put the fissile material and explosives in a truck with some guy and a hammer. We delivered in WWII in a propeller plane. I just don't see how the "news" could get any worse. This links to a fascinating obituary for Robert Conquest. "... An ardent Bolshevik as a young man, Conquest became a bitter foe of Soviet “Socialism”. He had first visited Russia in 1937 as a youthful devotee of the great experiment. It was a half century before he returned in 1989, having spent his life between chronicling the horrors the country had endured, and emerging, in the view of the Oxford historian Mark Almond, as “one of the few Western heroes of the collapse of Soviet Communism”. “He was Solzhenitsyn before Solzhenitsyn,” said Timothy Garton Ash. "Of his many works on the subject, perhaps the most important was The Great Terror, published in 1968 and detailing the full enormity of what Stalin had done to the Russian people in the 1930s and 1940s. The Mexican writer Octavio Paz paid the most succinct tribute to this book when he said in 1972 that The Great Terror had “closed the debate” about Stalinism." And we now have a socialist openly running for president ("Go get ’em" Bernie Sanders). And we have huge minions ardently following him. And we have a lapdog media singing his praises and failing to point out that socialism is the arch enemy of The American Way and everything this nation stands for. And this man commanding media attention calls for redistributive economics, central controls on the economy, and abject collectivism, all of which are proven failures and tyrannical forms of governance. And nowhere in the mainstream is "balance" from reporters, with reference to individual effort, entrepreneurship, profit motive, self interest, capitalism, free markets, laissez faire, personal responsibility -- none of the values that made America the most prosperous bastion of freedom the world has ever seen. Socialism should be debunked not defended. Who Gets U.N.'s Billions of Food Dollars? In lockstep compliance with Dr. Brown's rules for vilifying guns in the "news," AP reporters Bassem Mroue and Albert Aji on Sundayturned a story about a vicious muslim terror-tactic abduction into yet another gun-bashing story, by using the slanderous word "gunmen," as Brown recommends, instead of anything more accurate or descriptive.